Descriptions of Union, WA usually run along the lines of "inspired by nature." The first time I encountered that aphorism I took it as artistic whimsy, but by the third website I read about Union, I became curious. Is only one person writing all of this advertising content? Maybe. Or perhaps there is something more here. Perhaps there is something inspirational about Union’s situation near the bend of the Hood Canal with uninterrupted views of Mount Washington, Mount Constance and the iconic Brothers. Maybe there is a muse in this coastal, Mediterranean microclimate colored by the luscious, green foliage of salal bushes and the imposing Western Red Cedar and the bright red trunks of the Madrona trees. Possibly more is fed than the stomach on Hood Canal seafood. At Union maybe the soul is fed too. When I started to examine the history of the extraordinary people that lived in this area, I began to see this inspired lifestyle stretching back countless generations. The members of the Skokomish Tribe are descendants of the Twana people whose traditional territory covered an extensive area along the Hood Canal, inland to the peaks of the Olympic Mountains. 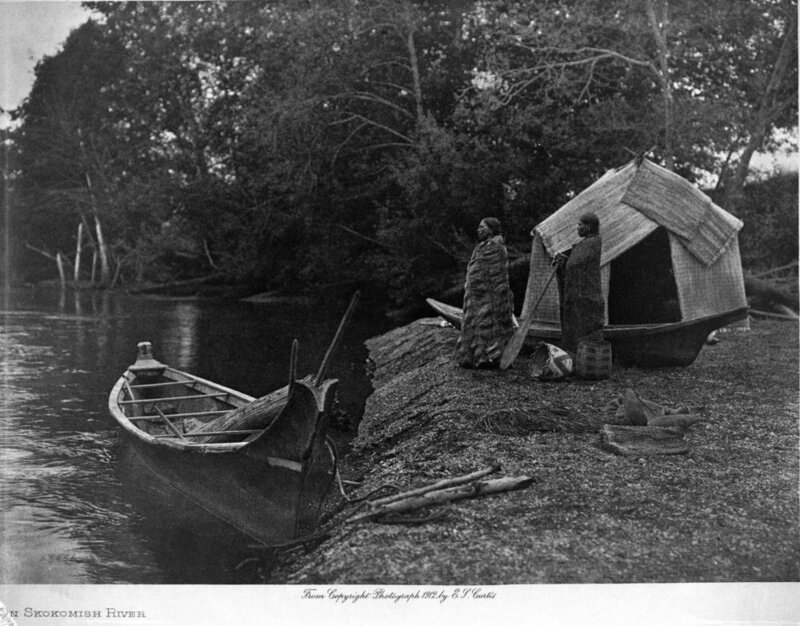 The Skokomish River on the Eastern side of the Olympic Peninsula with its productive salmon run and valuable grasses for weaving baskets was especially important to the Skokomish. When their lands were limited to a small section of the Skokomish River by the Treaty of Point No Point in 1855 one elder from the area, S’Hau-at-Seha-uk, voiced his fear of losing his home and way of life, “I do not want to leave the mouth of the River. I do not want to leave my home; and my burying ground; I am afraid I shall die if I do.” Despite losing traditional lands and the damaging effects of colonialism – the Skokomish are a thriving people. Skokomish arts and culture are informed and shaped by nature. Bear grass basket making, though threatened by development of the traditional picking sites on the Skokomish river, is an intricate example of natural resources, ingenuity and art coming together along with cedar carvings, dugout canoes, drum songs and traditional dance. To see a beautiful display of the technique and intricacy of the Skokomish basket makers or the ornate carvings drop in on the newly built Skokomish Community Centre (located just off of Highway 101). Opened in 2017 and located just outside of Union on the Skokomish Reserve, this intriguing hybrid building is a handsome example of Indigenous informed design – combining traditional plank, big-house style architecture with modern needs and conveniences—such as a gym, a meeting hall and a commercial kitchen. With over 400 solar panels on its roof the Skokomish Community Centre also offers a marvelous example of environment informing design. If you continue traveling Highway 101 past the Skokomish Salmon Hatchery and take the turn on to Highway 106 you will find yourself on a winding highway following the Skokomish River as it meets up with Hood Canal. After about twelve minutes of mossy delta and interesting views of cottages clinging to the thin strip of land between the road and the gently eroding riverbank reminiscent of a scene from Ken Kesey’s Sometimes a Great Notion you will head around the headland that opens up until the area we now recognize as Union. Known as duxWhLu’qWat3d to the Twana people, then called Skokomish by early settlers, in 1889 it was renamed Union City by lumberman, developer and legislator John McReavy to celebrate Washington’s declaration of statehood. McCreavy was a boom and bust figure who had dreams of creating the “Venice of the Pacific” in Union. His mansion built in 1890 on the bluff overlooking Union is the site of a loving restoration project and is purported to be the oldest pioneer house on Hood Canal–and of course hosts a few ghosts. As you continue on the East State Route 106 you will pass shops and a general store. Along the highway you will find the remnants of Olympus Manor, Washington’s first artist’s colony created in the 1920s by the charismatic artist and musician Orre Nobles and his family. Influenced by an Asian -Art Deco aesthetic Olympus Manor was resplendent with a music room enclosed with rescued stain glass, a pipe organ and rich oriental rugs underfoot. The grounds were complete with a Torri gate that was crowned with a Native American dugout canoe. Although destroyed in a fire in 1952 the glamorous stories of the artists, musicians, actors, and stars that came to partake in the Hood Canal’s delights at Olympus Manor are the stuff of legends. For a colorful and fascinating account of this early historical era of Union pick up a copy of Michael Fredson’s The Artist Colony on Hood Canal: Pixley, Orre Nobles & Waldo Chase (2011). Another honorable mention found along this highway is the Robin Hood Village and Restaurant, built in 1934 by Don Beckman. A set designer from Hollywood, Beckman is known for working on the set for the classic Robin Hood starring Errol Flyn. In fact, one of the Robin Hood Village's early visitors was Errol Flyn himself. The area has retained its reputation as an artsy community and guests of Robin Hood Village have the option of staying in the new cabins or historic cottages, one of which is rumored to be the cottage where Flynn stayed after he finished filming the classic tale and came to visit his old friend Beckham. The Restaurant and Pub carry on the arts tradition in Union with their year-round live entertainment feature local and visiting musicians. After the sharp bend in the highway you head a bit inland and encounter the refurbished Dalby Waterwheel. Originally built in the 1920s, Edwin J. Dalby created the first source of hydroelectric power on the Hood Canal to provide electricity for his Seattle bride, Ethel. Ed Dalby was raised on the Canal and an adapt linguist speaking Skokomish and the Chinook Trade language. While studying at the University of Washington he worked as a researcher for the photographer Edward S. Curtis on his controversial The North American Indian (1907-1930) which strove to document in twenty volume images of the purported vanishing culture of the Native Americans. Now considered overtly racist in the project’s main philosophy that indigenous culture and identity was slated to be subsumed by Euro-American culture and many of the photographs Curtis produced are criticized for being too contrived, there is however an artistic, romantic quality to many of the pictures that transcends this. Dalby introduced Curtis to the Skokomish Tribe and, with the assistance of Skokomish brothers Frank and Henry Allen, persuaded local tribe members to pose in costumes, in imaginative scenes. The misty shot of two women standing near a reed tent and beautiful cedar dugouts is iconic and quintessential. However, it is–like most romantic notions– highly contrived. 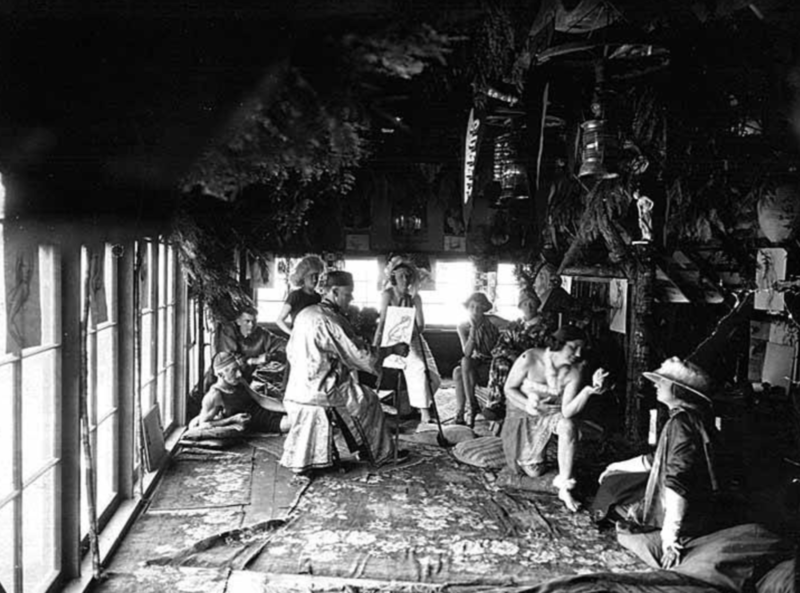 Skokomish people in 1912 did not wear reed clothing or live in reed tents, being more accustomed at this time to western clothes and plank houses. Henry Allen continued to assist Curtis and Dalby accompanying them in their work as far as North Dakota. Henry Allen’s voice was also recorded by Curtis on wax discs singing traditional songs. Curtis combined the recorded music of many different Native American voices and their photographs to create a musical slide show which he dubbed a “Picture Opera.” Curtis took his “Picture Opera” on tour across the country and played to a packed audience at Carnegie Hall in NY. Skokomish music continues to influence Carnegie worthy works. On May 24, 2019 Union’s Great Bend Chorale and Youth Chorale led by Matthew Blegen will be performing at Carnegie Hall as part of the Distinguished Concerts in New York series. They will be performing a commissioned piece by conductor John Muehleisen inspired by early Salish recordings. The hybrid work titled Borders begins with a Salish song of welcome, then Muehleisen weaves together European, African, Asian, and Latin American folk songs with his own settings of the poetry of Emma Lazarus, Brian Bilston, and Alberto Ríos in a powerful and moving musical journey that explores the historical roots of immigration and the modern relevance of America’s identity. The work takes up the question: How are we to treat the stranger, the foreigner, the outsider, and the “Other” amongst us? The local debut will be June 1 in Shelton and June 2 in Bremerton. Hosting a rich tradition spanning generations of first people and settlers, Union hosts fantastic views of the Olympics and Canal while embracing the arts and community. It is little wonder it was voted one of the 20 Prettiest Towns in USA by Forbes Traveller. Whether it is the people, the history, the music, the food or the natural beauty, Union has something inspiring for everyone.